So I’m sure all of you are wondering where I’ve been. Well, for the next week or so, I’ll be staying at my friends’ house in NJ (which is super cool, by the way), and every morning we’ll be going to sailing camp on the Delaware River! How cool is that?! 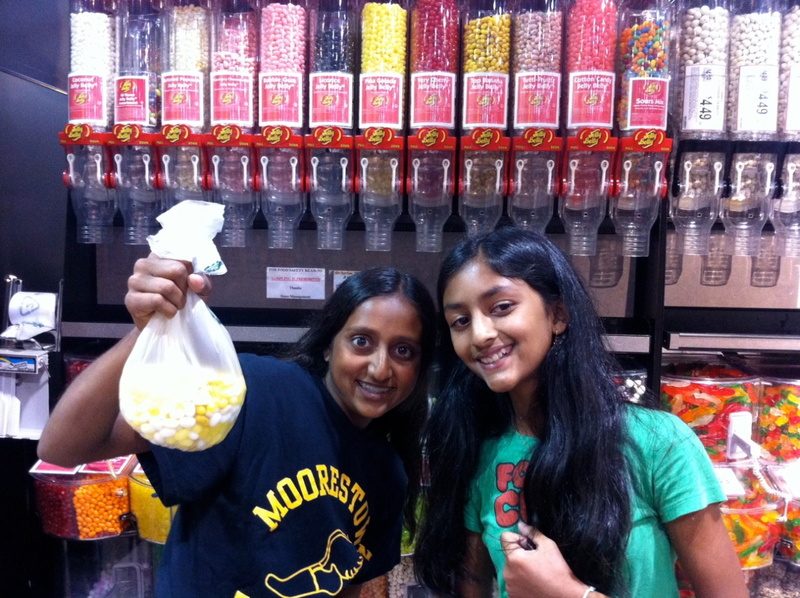 So off we were to Wegman’s, where we proceded to buy the biggest bag of jelly beans I’ve ever seen. 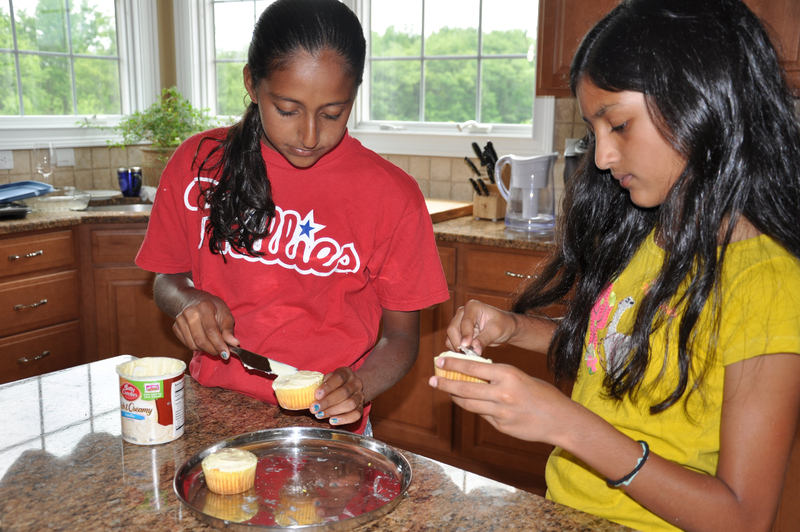 Step #1: Make sure that you have 24 cupcakes baked, cooled, and ready to go! 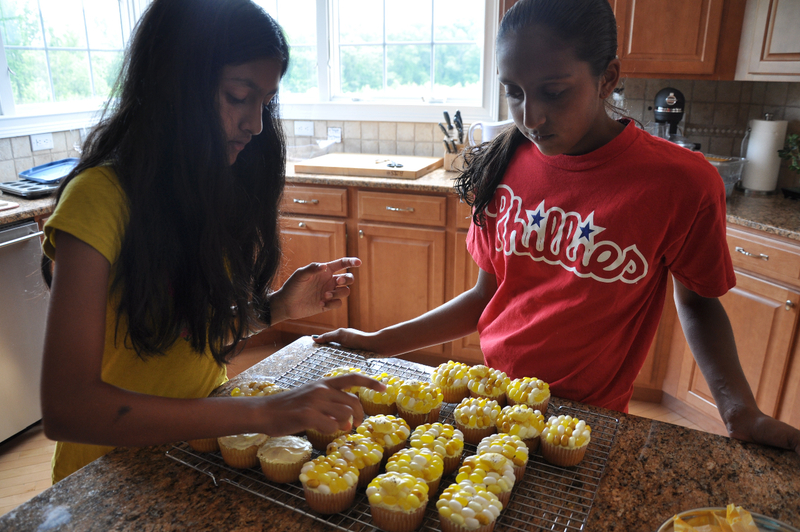 Step #2: Tint vanilla frosting a pale yellow w/ the yellow food coloring, and lightly frost the 24 cupcakes. 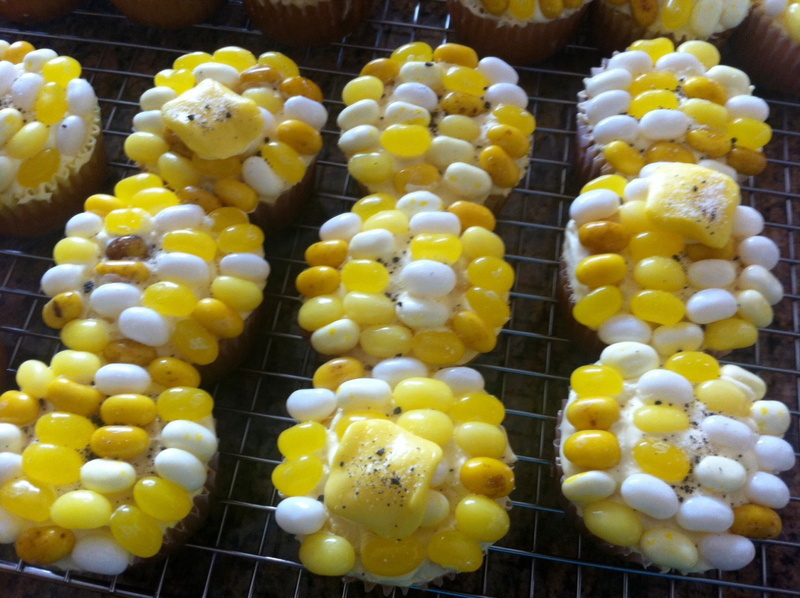 Step #3: Working w/ 3 cupcakes at-a-time (lined up in a row), arrange about 5 rows, with about 6-7 jelly beans each, close together on each cupcake. Step #4: Slightly mold each of the starbursts (with your hands) into a shape resembling a pat of butter. Step #5: Sprinkle sugar + cookie crumbs evenly over each ear of corn. 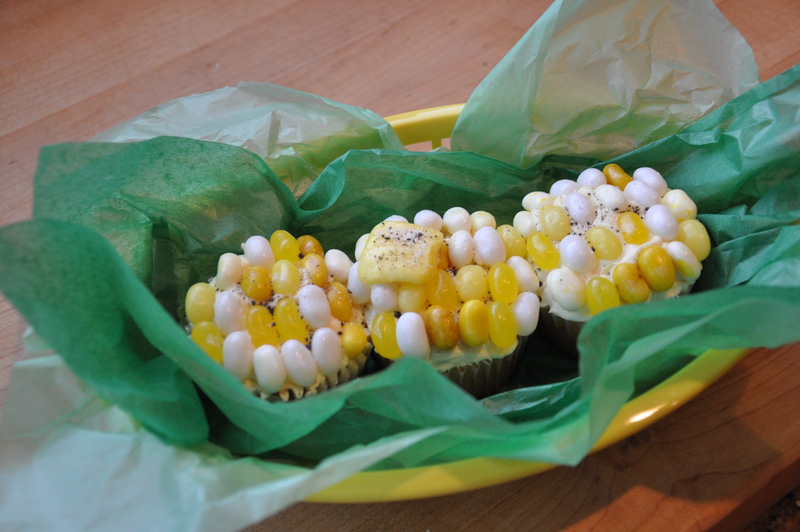 Step #6 (optional): Line corn holders w/ tissue paper, and place an ear of corn in each. 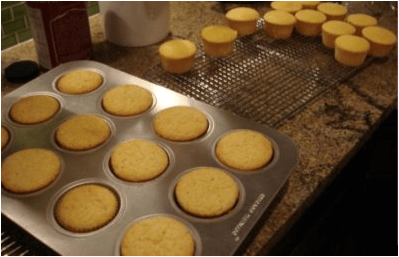 So – what did we think about this recipe? 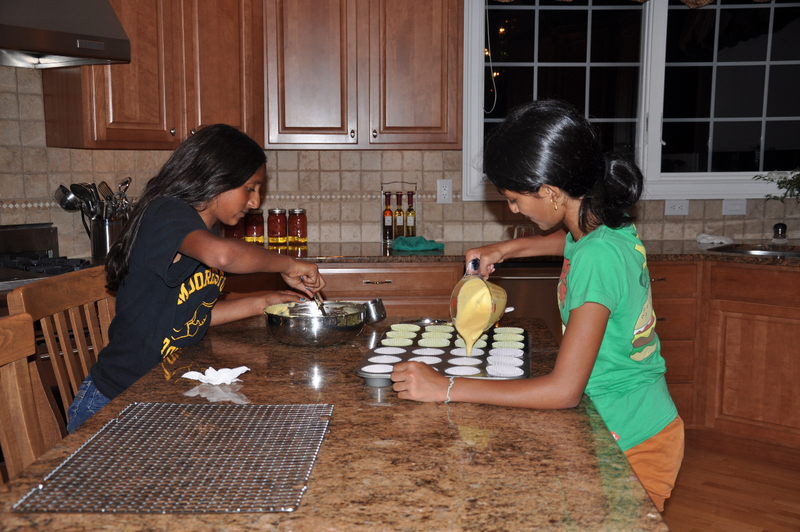 Well, we both decided that, ultimately, it looks a lot better than it tastes. For some reason, buttered popcorn and pina colada just don’t really taste that great together – although they do look rather nice. 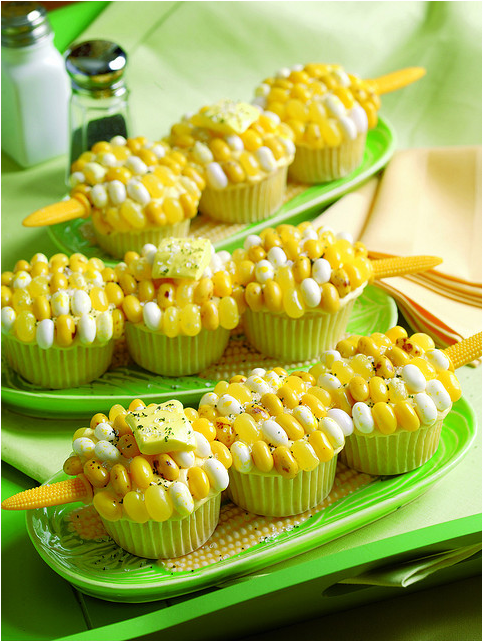 And there was an awful lot of jelly beans on each cupcake, which was a lot for one person to eat at once. But overall? They were a super cute, super fun project, which we would totally recommend for a summer barbeque, a picnic, or just anytime.